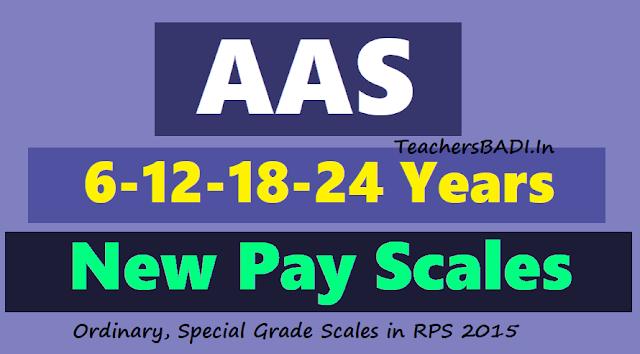 New Pay Scales in PRC 2015, Ordinary Grade Scales in RPS, 2015, Special Grade Scale in RPS, 2015, AAS/Automatic Advancement Scheme 6-12-18-24 Years New Scales in PRC 2015- AAS/Automatic Advancement scheme: A person enters in to a corporate company where there the persons worth, skill plays a prominent role, if that person works above the in the form of promotion, where this promotion acts as medicine which gives happiness/pleasure and that employee feels responsible, works more hard, he/she may get any no. of promotions with in no time (short period). Where no age, seniority take in to account, only worth, knowledge, skills, results are the barriers of the promotions. Who plans perfectly they gains it. But if we come to govt employees, there are perfect rules and regulations where here seniority takes significant role. These promotions depends on the vacant position of particular department or serial number in the seniority list. Where here caste also takes efficient role. So, Telangana govt decided to give monitory benefit instead of promotions, those who crossed the eligibility and did not get promotions can be benefited by “ Automatic advancement scheme”. The increment as 6-12-18-24 years scale. All unions requested to reduce the gap 5-10-15-20-25 years but 10th PRC did not accepted and govt finance department has issued AAS PRC 2015 GO.Ms.No.38 according to the tenth Pay revision commission recommendations. After some specified period/service also it the employees are continuing in the same post without any promotion they will get the increments which is known as “automatic advancement scheme “ which is implementing from 1981. Where the old system is as usual. Where this gap is 8-16-24 from 9th PRC the gap is reduced to 6-12-18-24 which remained same in this PRC. Where this committee mentioned that it may not be changed in this PRC. As per G.O.Ms.No.117, Dated 25.05.1981, the Government introduced the Automatic Advancement Scheme(AAS) to the State Government employees and employees of Local Bodies as a substitute for those who are entitled to get promotions, but are unable to get them at regular intervals because of stagnation due to non-availability of vacancies. According to this Scheme, every employee after a service of ten years in a particular scale shall be eligible for the next higher scale, called Special Grade Post Scale. A Government Employee who completes a period of 15 years in a particular scale shall be eligible for promotion scale called Special Temporary Promotion Scale. The fixation of pay on appointment to the posts under Automatic Advancement Scheme shall be in relaxation of relevant provisions of the Andhra Pradesh Fundamental Rules. The employees upto XVIII Grade in RPS 1978 were eligible for this scheme. In Govt.Memo.No.41086-202/PRC I/81-1 Fin &Plg. (FW PRC.I) Dept., dt.31.12.1981, it was clarified that the appointment to the Special Grade Post / Special Temporary Promotion Post / Special Adhoc Promotion Post is not a promotion to a higher post involving higher duties and responsibilities of higher post. The Government in G.0.Ms.No.266 G.A (Ser.A) Dept., dt.25.05.1981 made an Adhoc rule to the above extent. The Automatic Advancement scheme(AAS) was further extended to Teachers working in Government, Municipalities, Municipal Corporations, Zilla Parishads and Panchayath Samithis and also Aided Institutions as per GO.164, dated: 0106-1982. Government agreed for the change of periodicity from the existing 8/16/24 to 6/12/18/24 years, for appointments under the Automatic Advancement Scheme and accordingly orders were issued. - SPPII/ SAPP-II after 24 years. 1. As per GO.38, Dated:16-04-2015, The existing Special Grade, SPP-IA/SAPP-IA/SPP-IB/SAPP-IB/SPPII/ SAPP-II shall be continued with 6-12-18-24. 2. The benefit of Automatic Advancement Scheme shall be continued up to and inclusive of Grade-XXV in the revised scales i.e., Rs.49,870-1,00,770. One increment shall be allowed in the existing scale on appointment to Special Adhoc Promotion Post Scale I -B.